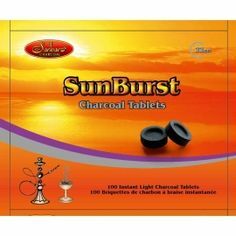 The Sunburst instant light tablets are an odorless, high quality charcoal that are easy to light. They typically last 45 minutes. These coals are great on the go or at home. They can be lit on the stove or just as easily with a basic match or lighter. With Sunburst fast lighting coals, you can have your favorite shisha flavor flowing through your hookah with minimal effort. The Sunburst package contains 10 aluminum foil wrapped rolls of 10 charcoals each, for a total of 100 charcoals. Lets Vape & Smoke Shop KC is a full service head shop located near Liberty mo, lees summit, gladstone, overland park. We offer premium charcoals, wide selection of hookah charcoals, hookah tobacco, top brands as well as local made. High quality and huge variety of flavors are available.